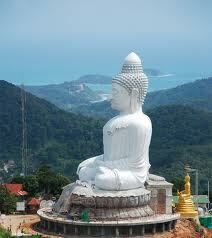 Phuket is one of Thailand many islands situated on the southwest coast of it. It is 860 km south of Bangkok. It is located in the Andaman Sea which is a part of the Indian Ocean. It’s the biggest island in Thailand and it is considered as a province, the island is 49 Km long and 21 Km wide, the total area of it is 570 Km2. All around it there are so many islands which the most famous is Koh Phi Phi. 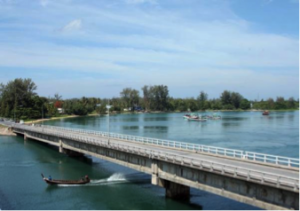 It’s connected with the mainland of Thailand with Sarasin Bridge which crosses the 600 meters of water which makes Phuket an island. Phuket is composed of granite and sedimentary rock and there are so many hills covering the landscape, the most famous is the one with Big Buddha on the top, from there we can have a view of all over the island. The island has about 70% coverage by forest which is generally located on the west coast. The western coast also has several sandy beaches, while on the east coast beaches are more often more muddy and smaller. However, east coast is a considerate “green” with a lot of mangrove forest. Near the southernmost point is Laem Promthep (Brahma’s Cape), which is a popular sunset view point. 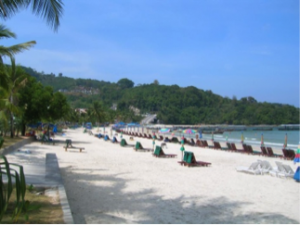 One of the most popular tourist areas on Phuket is Patong Beach on the central western coast due to easy accessibility to its wide and long beach. Most of Phuket’s nightlife and cheap shopping are located in Patong and the area has become increasingly developed. On December 26 2004, the tsunami scrapped one of the most famous beaches of Phuket. However, thanks to a burst of energy on the part of the population, has been rebuilt and cleaned at a record pace. Indeed, there is few or no trace of this tragic episode. Patong is considered the most dynamic range for outings and shopping sprees, especially with the big Jungceylon mall or places like the Hard Rock cafe and Tiger Bar. Cultural pluralism is everywhere in the city, so you can drink and eat Italian or sauerkraut in some parts of the city. Most shops are open through the day and late into the night. All conditions are met in the city so that the services offered to tourists will be open 24 hours. Space, water sports available, local restaurants on the beach and a village atmosphere characterize Kata. Undoubtedly intended to relax rather than an active and sporty holiday, this wide range curve is currently divided into 2 bays, Kata Yai and Kata Noi, seperated by a rocky headland, Kata Yai is a range of two kilometers of white sand lined with trees and a few restaurants, while Kata Noi, the smaller beach, offers seclusion and tranquility. Unlike Patong, Kata development was done slowly and with emphasis, with small guesthouses, some resorts, local restaurants and small shops plus some original attractions such as Dinopark Minigolf. Club Med, established more than 15 years, is located in the center of the main beach and effectively preclude an ugly swing. The city center is located just off the beach with shops and events around the Kata Corner at the north end. The southern tip is occupied by restaurants on the beach and hotels. There is a bus service between Kata and Phuket Town in the day. It is an ideal beach for family holidays and snorkeling practice in high season. 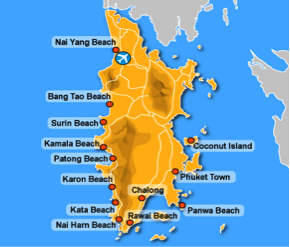 Just 10 minutes south of Patong Beach is a long stretch of white sand, Karon. The second largest beach in Phuket is quiet, with many very good local restaurants and a wide range of accommodation, from family pension to resorts offering various sports and leisure activities. The nightlife is not as varied or colorful than Patong. At Karon, people come to enjoy a good meal, drink on the terrace with friends or daydreaming while watching life unfold before their eyes. And if you fancy a change of scenery, it’s easy. 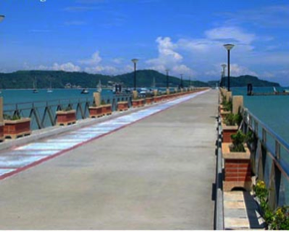 Kata village is easily accessible on foot, and Patong is not far by car for a lively evening. Sand is a unique phenomenon in Karon – as you walk on the white sand, you will hear squeaking! Nobody seems to know why. From November to April, Karon offers perfect conditions, but from May to October, bathing is sometimes dangerous due to currents, so be sure to watch the flags. During the past years, Kamala Beach has changed dramatically from the small fishing village with buffalo trotting along the deserted beach in a small town lively and active. Many hotels have opened here and there, from the most luxurious to the cheapest, but all offer a great quality / price and excellent service, typical of Thailand and Asia report. To get to Kamala, a distance of fifteen minutes drive north of Patong on a beautiful renovated road you can admire the stunning views of Kamala Bay with its turquoise waters and sandy white beach. Kamala is divided into two bays. 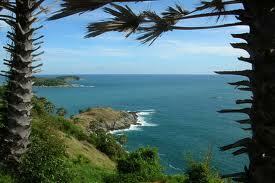 The main beach is a crescent with 3 km of pines on its first half and coconut or palm sugar on the other. A little further south, the second track is smaller and more isolated and home to the Terrace Resort Kamala Beach. The second, “Kamala Street” is narrower and quieter. It crosses a small bridge near a newly built Thai Temple, through the school of Kamala along the bay and enters the heart of Kamala. Surrounded by many small and large restaurants and bars, it is nice for a stroll in the evening because of low traffic (unlike Patong Beach). Grocery stores, tailors, souvenir shops, diving centers and travel agencies offer their services throughout the day and are often open until late at night. The beach is wide and sandy, with tropical blue water like you see on postcards. Chairs with umbrellas are available everywhere at low prices. You will not really bother by the hawkers here who know how to be discreet and do not insist if they refuse. However, if you’re tempted, do not forget to haggle tight! The city of Phuket, Thailand, was founded a little over a century by Chinese traders and Malays came to exploit the tin mines around the port of Phuket close being more adapted to receive larger vessels than the traditional port city of Thalang. 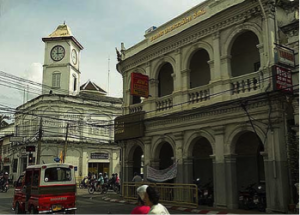 Despite the difficulties inherent in growing a thriving city, and despite the massive fire that destroyed much of the city, Phuket town grew and prospered to become the commercial and social center and political of the island. The early 20th century was a period of positive growth for Phuket. The exploitation of tin mines prospered, and caring and very competent governor Rasada Korsimbi contributed to the diversification of the economy of the island. Being the capital city of Phuket its modern expansion grew quickly; its streets mark out significant buildings and boats around the world did stop in its busy port. Today, the main attractions of Phuket Town are the old Sino-Portuguese buildings, Chinese and Thai temples of refined architecture and popular markets. Most buildings downtown date back about a hundred years ago, during the first period of prosperity for the operation of tin. Their architecture, the so-called Sino-Portuguese, denotes the mixture of Chinese and Western influences. This style is also common to all mining in the Malay Peninsula coastal regions. These characteristics constructions are longer than wide, and the entrance is decorated with finely crafted fantasy lattice. You’ll see some lovely examples Dibuk Road, and if you walk up, you will pass the most important of them: The Town (Phuket’s Town Hall), the Provincial Court (Provincial Court), and the Nakorn Luang Bank. But the most representative of the architecture of the early century public building in Phuket is the Governor’s House (Government House). These past few years, Phuket has grown considerably, but has managed to retain its customs and origin from its multi-ethnic roots traditions. 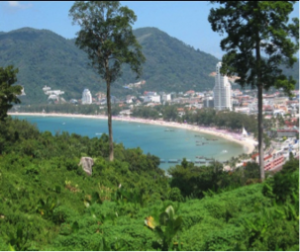 The best way to enjoy an overview of the city of Phuket is to walk up to the hill of Rang Hill, just north of the city. This place is known for its impressive forest of tall pines. Hawkers of fruits and food settled around the park, doing good business, especially on weekends. As everywhere in the south of Thailand, if you find a beach frequented by Thais, you will also find many stalls where you can taste all kinds of grilled seafood and other good things. Nai Yang Beach is no exception. At low tide, if you swim you will find nearby a large coral reef that is home to many marine species. Here, shells sometimes back to shore, especially after a monsoon storm. Nai Yang Beach gives a very different impression of the southern beaches. The Pearl Village Beach Hotel in front of the beach usually hosts an elephant, giving you the opportunity of a little excursion on his back in the sea with a few sessions of watering for a few baht. 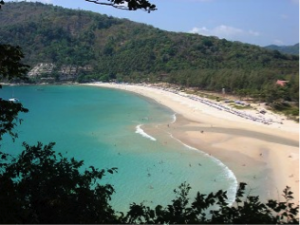 Nai Yang is also the last step safari beaches of the north coast. 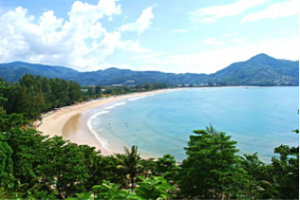 Located at the north end of the island, there are two beaches, Nai Yang and Mai Khao beach, and covers no less than 10 miles (16 km) of white sand. From above, at low tide, the sea can seem muddy compared to the transparency of the beaches further south, it is partly for this reason that these beaches are less popular with tourists and are less developed. Another reason is the shore that falls steeply on several levels, creating unpredictable and dangerous ocean currents during the monsoon season. This makes it an ideal place for giant sea turtles (Giant Ridley Sea Turtle), which can weigh up to 850 kg (1874 lb) and are shy creatures, so preferring to have a beach to themselves. Each year, between November and February, these lumbering giants haul out onto the beach at night to lay their eggs, digging holes with their flippers to bury. They can lay up to 200 eggs. This instinctive behavior is older than 90 million years. Unfortunately, the number of sea turtles by making an annual appearance continues to decline. To ensure re-population, awareness programs have been implemented for the people, and young turtles born in captivity are released. The turtles usually lay very late at night, but maybe you’ll get to witness the miracle of nature. Then be very discreet and try not to disturb them. The authorities are closely monitoring the eggs, moving many of them in areas of special hatch. This narrow and picturesque bay is a favorite among Thais for picnics. They will gather around the stalls of seafood in the shade of trees. On the other side of the road, there are many Thais and Europeans restaurants where many residents like to spend their evenings. The beach is not great but the water is shallow and safe for children, sheltered from the wind. Many longtail boats and speed boats (outboard) are anchored and can be hired for trips to neighboring islands such as Coral Island which is 15 minutes by speedboat. Not far away on the road back to Phuket, the Museum of shellfish (Seashell Museum) may be of interest to collectors. Rawai is one of the few places where you can buy shells. Quiet and serene, this bay offers all kinds of boats (sailboats, yachts and cruise ships) shelter against strong winds. It is also the starting point for excursions to the famous islands such as Phi Phi, Coral Island, March Thon Island, Racha Islands and to dive sites Koh Doc Mai and Shark Point. The bay teems with life at the first light of day until 9, when the boats leave for the day’s destination. Then again bustle back cruises and excursions between 16 h 30 and 17 h 30. At night, the restaurants of the pier attract busloads of tourists arriving after admiring the sunset from Promthep Cape. ‘Prom’ is the Thai name referring to the Hindu god Brahma “signifying purity and «Thep»is the Thai word for God. Promthep is a headland that plunges into the sea, forming the southern tip of Phuket Island. It is traditionally the first point on the coast that see the sea approaching the island. No trip to Phuket is complete without taking a few photos of this magnificent panorama. The best time to visit is the sunset over the Andaman Sea. But do not miss the sunrise if it is possible, because many people find it even more spectacular and the crowd is less dense. The view is almost irresistible for a photographer, especially when the bay reflects the colors of coral reefs, changing shades of the waves crashing on the boulders. This entry was posted on Thursday, September 26th, 2013 at 11:28 am	and is filed under Phuket. You can follow any responses to this entry through the RSS 2.0 feed. Both comments and pings are currently closed.